Bill Robichaud ’83 just wanted to go hunting. He’s always juggling time zones between his work in Laos and his home at the edge of Wisconsin’s Driftless region. Just recently returned from Southeast Asia and still adjusting to Wisconsin time, he had awakened at 3 a.m. and decided to finish assembling a gun. Now he wanted to use it to go deer hunting. Thirty-five years ago, his older brother Doug had presented this perfect birthday present: a build-your-own, .45-caliber, flintlock Kentucky rifle. Robichaud almost finished the kit, but put it in storage as his home base floated through four states. He drifted further afield, to Afghanistan and Vietnam. Eventually, he found his life’s mission following the 1992 discovery of a rare new forest creature, the saola (rhymes with “now, la”), in the Annamite Mountains dividing Vietnam from Laos. Sometimes called the Asian unicorn, its long horns curve up and slightly backward and look like a single horn in profile. Robichaud would spend two decades in Laos, and still visits often as head of the Saola Working Group, charged with saving this spectral beast. He saw a saola once, in 1996. There have been only a handful of reports since, and a wildlife armageddon has unfolded on its home range, which makes his desire to go hunting interesting. Hunting is a big part of the problem there — indiscriminate slaughter to feed the wildlife markets of Vietnam and China. It’s nice to be in Wisconsin during deer season, where hunting is conservation. The hunting connects him, in unusual ways, back to Laos. There are few regions more distant from Wisconsin, but it’s that hunting state of mind, trying to be as quiet as possible in the twilit space between night and day. Hunting rewards nothing quite so much as perseverance. It’s been 21 years since Robichaud last saw the saola, and still he works with intensity and resolve, fueled as much by hope as knowledge. It’s the kind of patience that circles back 35 years later to fire a gun. Birds came first. Young William Robichaud fell in love with raptors at the age of 10, got a falconry permit at 15, and then acquired Genghis. (“What else are you going to name a hawk when you’re a teenager?”) His family still calls him Birdman, or just Bird. In high school, he approached UW professors for independent-study projects. When not in school, he worked banding raptors on the shores of Lake Michigan and ospreys in the New Jersey salt marshes. Travel was dicey. The capital, Vientiane, was a city of bicycles, and few roads were paved. Police would visit foreigners’ rooms and track their plans. Robichaud’s first visa was good for only two weeks, but he was hooked. In such an unexplored region, the potential for biological discovery was great. He went home, secured some research funding, and returned. In 1992, he was sitting in a café with a Bangkok paper when he read about the nearby discovery of the saola. Hunting trophies had first tipped off the scientific community to its existence. Biologists hadn’t managed a live sighting or capture, but locals confirmed that the animal was still around, although elusive. Robichaud connected with the team setting up the country’s first protected areas, then joined the Wildlife Conservation Society’s (WCS) survey crews. None of the new parks had been examined before. The resulting pace of discovery of large vertebrates was unheard of in the last 100 years: two new species of deer; saola; and a new family of small mammal. “Laos gave you that sense that you were doing something important,” says Robichaud. Rob Timmins, who works with Robichaud on saola conservation, collected a new species of rabbit for sale on a table at a wildlife market. “We were finding really great things,” says Timmins, though the conservation situation seemed desperate. “In hindsight, those were the golden days. I had no clue how bad things could possibly get.” In January 1996, not long after Robichaud took over the Wildlife Conservation Society’s field office in Vientiane, two of his field biologists reported the extraordinary: in the remote outpost of Lak Xao, a live saola was on view in the personal menagerie of a local general. “It was just incredible and remarkable,” recalls Nancy Ruggeri ’88, MS’95, PhD’11. “We just stood there deciding what to do.” The verdict: get Robichaud. He was stunned, and fortuitously, scheduled to fly through Lak Xao on a survey the next day. The saola “was like something from outer space,” said Alan Rabinowitz, Robichaud’s boss at the time. Later genetic analysis would explain why: it wasn’t just a newly discovered species; it was a new genus. Though it appeared antelope-like, it was more closely related to cows. Robichaud decided he should stay with the saola, and Rabinowitz was a little surprised — he couldn’t imagine skipping the survey. But Robichaud had grasped this ephemeral moment. The saola’s complete calm left a deep impression as he sat on a nearby chair, taking notes for most of the next two weeks. He named her Martha, after a particularly calm and collected WCS colleague. From that experience, he published the most complete description of a saola to date: just over three feet tall, her coat was a rich brown, lighter on the underside. The nine-inch tail was banded brown, cream, and black. White patches adorned her face and throat. Her eyes and nose were brown, her tongue was remarkably long, and a small cluster of whiskers adorned the chin. Some have questioned Robichaud’s assessment of her calm, arguing Martha must have been catatonic from the stress of capture. But Robichaud knows catatonia — he’s handled thousands of raptors — and argues that Martha’s demeanor was consistent with the behavior of other deep-forest ungulates such as the okapi or the Sumatran rhino. “You bring them into captivity and they are a lot more chill than most other captive wild animals.” And Martha was still capable of response, freaking out when a dog approached. Even harder, Robichaud has watched as destruction has engulfed the saola home range. Author William deBuys joined one of Robichaud’s field expeditions in 2013 and wrote a book about it called The Last Unicorn, which was one of The Christian Science Monitor’s 10 Best Nonfiction Books of 2015. On the trip, they encountered endless signs of pressure: poaching camps, carcasses left to rot, long lines of crippling snares constructed with bicycle cable. It wasn’t supposed to be this way. In 2005 the Lao government, desperate for development cash, began constructing the Nam Theun 2 dam, diverting a major tributary of the Mekong River to generate electricity for sale to Thailand. 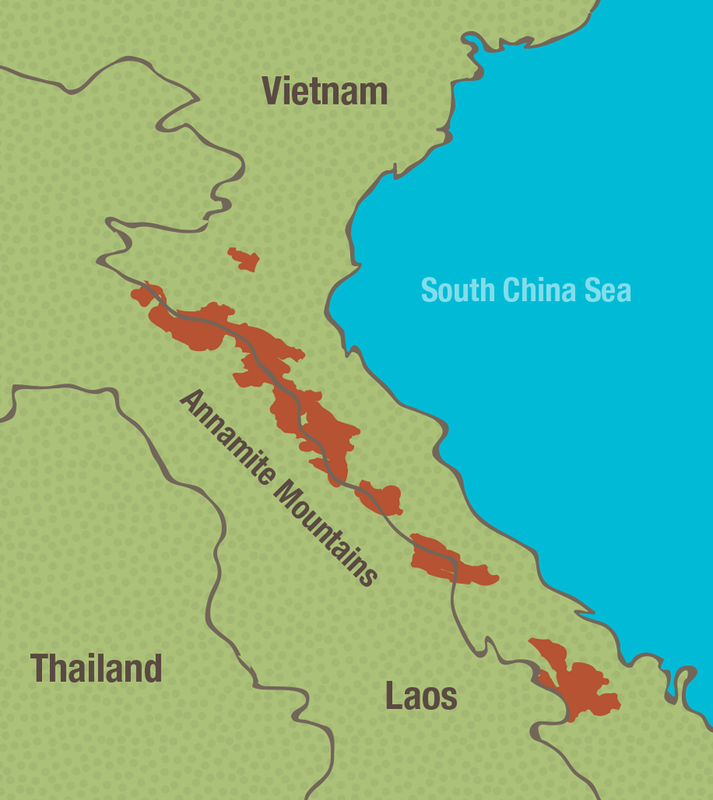 The World Bank funded the dam, requiring Laos to protect the neighboring Annamite highlands to compensate for land lost to the man-made lake. Indeed, the bank went further: it said that without conservation, the entire project would be considered a failure. The dam sends electricity to Thailand in exchange for about $240 million annually, accounting for 5 percent of the Lao economy. But by widespread consensus, the conservation goals have met with disaster. “I was on the river on the evening of its last day of natural life,” recalls Robichaud. “I think in 50 years when they’ve perfected solar power or nuclear fusion or something, this is going to seem so crude. You destroy a millions-of-years-old river just to run a few air conditioners in Thailand. What a tradeoff.” Pao Vue ’03 is Hmong, born in Laos. His family moved to the United States when he was two, eventually settling in Wisconsin, where Vue is now a PhD candidate in geography at the UW. While doing fieldwork in Laos, he also collected biological and cultural evidence of the saola for Robichaud. Sometimes they traveled together — Robichaud translating Lao for Vue, and Vue translating Hmong for Robichaud. On one of Robichaud’s recent trips to saola country, villagers volunteered a story about Mr. Ka, a well-known hunter who probably sells wildlife over the Vietnamese border. “He’s kind of a sneaky character,” says Robichaud, who first met Ka in the late 1990s. Clearly Ka knew the saola — he had four sets of horns on his wall — and Robichaud hired him as a guide. The temptation to trade in rare wildlife in this region of Laos is great. For instance, Robichaud knows that if Ka finds the increasingly rare golden coin turtle, he will absolutely sell the animal. It’s treasured in Chinese Traditional Medicine and will likely fetch more than the lifetime earnings of the average Lao. Robichaud says that at one point, Ka’s dogs had chased a saola and her calf down to the village. Not only did Ka not kill them — he also gave Robichaud credit for the save. In the late 1990s the saola population was estimated at between 70 and 700. Robichaud believes they are still out there, but they haven’t been verifiably seen or photographed since 2013. There may now be fewer than 100, stretched between a few isolated areas. “Even if you could wave a magic wand and stop all poaching today, there is a fair chance every subpopulation would drift to extinction,” Robichaud says. Conservation has shifted toward the addition of a captive breeding program in Vietnam, with experts mobilized to help figure out feeding and reproduction. Incredible challenges await the project, and yet the story of Ka’s reprieve heartens Robichaud. Conservation is often justified for a range of economic reasons, but Robichaud doesn’t go there. “I personally believe you can’t make an economic argument for the saola,” he says. “It has no economic value to anybody, but it’s still worth saving, because it’s this incredibly beautiful, amazing thing. And that should be enough to pay its own way.